For tape up to 1 1/2". Use to connect fence charger to tape or as an end clamp. 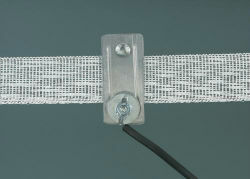 May be used to fasten 1/2" tape to a gate handle.